Rigorous examination of relationship between loss of energy, mass, and radius of stars in a steady state. Unabridged, corrected republication of original (1939) edition. "The material is throughout presented with enviable crispness and clarity of expression. The work will undoubtedly become an indispensable handbook for future researchers in the field." ― Nature. The great Indian astrophysicist Subrahmanyan Chandrasekhar (1910–1995), recipient of the Nobel Prize in Physics in 1983 for his work on the later evolutionary stages of massive stars, was not only the author of several books reprinted by Dover over many years, but a frequent and highly valued reviewer of titles in his field during the 1970s and 1980s. 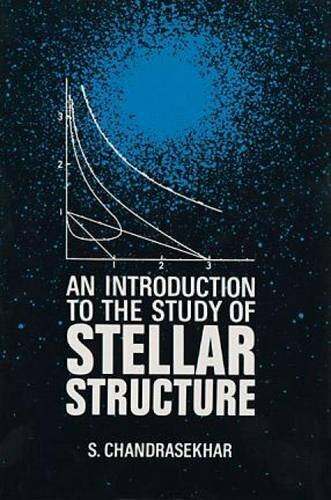 Chandrasekhar's books, published by Dover, are: An Introduction to the Theory of Stellar Structure, 1967; Hydrodynamic and Hydromagnetic Stability, 1981; Principles of Stellar Dynamics, 2005; Ellipsoidal Figures of Equilibrium, 1987; and Radiative Transfer, 1960. For those concerned with the distant future ― the really distant future ― Chandrasekhar's name will always be associated with the Chandrasekhar Limit, the figure of 1.44 solar masses, the minimal mass above which a dying star will collapse into a black hole following a supernova. People on Earth need not be bothered anticipating such drama: for us, when the sun dies, the lights will just go out. In astrophysical terms, our sun will at that point be a stable white dwarf.